Welcome to Merlin Flight School! There are two types of equipment for foot launched flight: hang gliders and paragliders. They both work on the same basic aerodynamic principals but there are some differences. A hang glider is a weight shift controlled flexible flying wing with an internal aluminum frame which weighs about 70 lbs and folds into a bag approximately 12" in diameter and 20 ft long. A hang glider must be assembled before flying it. The pilot lies prone in a harness attached to the hang glider and controls its speed and direction by moving his or her body. A paraglider is a frameless soaring craft that folds into a backpack style bag which weighs about 15 lbs. It requires no assembly before flying. The pilot flies in a comfortable seated position and controls the paraglider's speed and direction by the use of aerodynamic controls (brakes) which are attached to the trailing edge of the paraglider. Hang gliders and paragliders often share the air together. Both are capable of soaring aloft and of achieving distances of 100 miles or more. The advantages of a hang glider are that it is somewhat faster and has a flatter glide angle. Therefore, it is capable of flying in higher winds and can get from point A to point B easier and quicker. The advantages of a paraglider are that it is easier to transport and store, easier to learn to fly (10-12 days of instruction as opposed to 15-20 days for a hang glider), takes off and lands slower and can land in a much smaller space. It soars just as well and usually will outclimb a hang glider in thermal lift because of its ability to fly slower and turn tighter. Is paragliding the same as skydiving or parasailing? No. Although the first paragliders were very much like skydiving parachutes, they are quite a bit different these days and not at all interchangeable. Today's paragliders are designed to be launched off a slope like hang gliders. They are much wider and skinnier, with 40-80 cells as opposed to 7-9, the lines and canopy are made out of different materials, and they are set at a higher angle of attack (the angle at which the glider meets the apparent wind) in order to optimize their soaring capability. Parasailing is being statically towed behind a boat with a round slotted canopy. This is not flying because no dynamic lift is generated and the canopy is incapable of flying or maneuvering on its own. In fact, if the rope were to break the canopy would come pretty much straight down. In any event, let me try to explain how a paraglider is constructed/works. 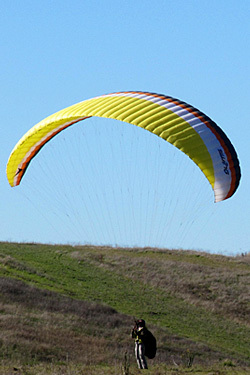 A paraglider is similar to a ram air type skydiving canopy in that it has a top surface and a bottom surface which are connected together by interior ribs which, if they were removed from the glider and laid flat would look very much like a cross section of an airplane wing (round in front, pointed at the rear, curved on top and flat on the bottom). The cells are the rectangular openings defined by the ribs and the top and bottom surfaces. The way that this all works is as the glider moves forward, air is "rammed" into the front openings and, since it has no exit, the pressure is always greater inside the canopy than outside. This creates a rigid structure. The lifting force comes from air moving over the top surface. This creates a lower pressure on the top of the wing than on the bottom. This is called Bernoulli's Principal. It's the same force which works for virtually all flying craft. Paragliders are visually different from skydiving canopies in that they have many more cells (40-80 as opposed to 7-9) and are somewhat elliptical (rounded at the tips) as opposed to rectangular skydiving canopies. How high/far can you go? Hang gliders and paragliders have been to over 20,000 feet and 300+ miles. Flights with altitudes of 10,000-15,000 feet and distances of over 100 miles are not uncommon. In order to launch you just need a slope facing the prevailing wind, a place to land and permission from the landowner. There are dozens of established public sites in California, hundreds around the country and thousands in the world, with more being opened all the time. What do you do when the wind stops? Sailplanes, hang gliders, paragliders, birds, paper airplanes, and power planes with the engine off all work on the same principal. Each mode of flight will trade a little height for forward momentum because of the design of the wing and the force of gravity. This forward speed generates an airflow over the surface of the wing, thereby creating lift. With no wind a glider of any type will fly around, slowly descending until it runs out of altitude, much like what would happen if you threw a paper airplane from the top row of the bleachers in a gymnasium. Paragliding and hang gliding are considered "risk" sports similar to surfing, skin diving, rock climbing, sky diving, etc. and, as such, it is important to practice good personal risk management. It is important to get good training in the mechanics of flying as well as in meteorology, micrometeorology, flight planning, emergency procedures, and personal assessment. The gliders are tested to certain structural and aerodynamic standards to determine their airworthiness and generally behave in a predictable manner even in unusual circumstances. The biggest variable is the pilot. If you get good training, progress slowly, fly cautiously and in reasonable weather and wind conditions on well maintained equipment, your chances of being seriously hurt or killed are minimized and you should have a long enjoyable flying career. However, like many of the sports mentioned above, we deal not only with ourselves and our equipment but also with Mother Nature who is unsympathetic to any carelessness, incapacity, stupidity or neglect. Generally, properly done, it's not scary at all but more of a tremendous sensual rush and/or feeling of tranquility and peacefulness. If it gets scary, you probably have/are doing something wrong. The best way to learn is from a certified school where you get professional instruction. Unlike some sports, like skiing for instance, the consequences of trying to teach yourself or having your "buddy" teach you can be disastrous. In fact, schools and dealers will generally not sell you equipment unless you can prove yourself competent to use it. No. In this country, paragliders and hang gliders are considered "non-powered ultralights" by the FAA and are covered under Part 103 of the FAR's and as such don't require government licensing. The major reason that this is so is that we have our own licensing system under our own association (United States Hang Gliding Association). The majority of pilots are rated and a lot of flying sites, especially those on public land, require it. The USHGA also provides property damage and liability coverage for its members, certifies instructors, and publishes a monthly color magazine. New hang gliders run from $3000 to $9000, new paragliders from $2500 to $4100, harnesses from $300 to $800, helmets from $130 to $250, reserve parachutes from $450 to $750. Used equipment can run from around $1000 on up, depending on condition and vintage. It's very important to make sure that the equipment is not only airworthy but is appropriate for you. Most good schools and dealers will not sell equipment that is of questionable quality and will conduct a complete inspection and test flight on the glider prior to its sale. You should insist on this. Your instructor is the person who knows you best so be sure to consult with him on equipment purchases. What should I look for when choosing a school? The school should be a USHGA certified school, use only certified instructors and the approved teaching method. You should find out about your instructor's experience. How long has he or she been teaching and where, what is his/her safety record, etc. Ask about the average size of classes and the maximum allowable instructor/student ratio. Find out where they teach. Does the training hill allow gradual progression from the bottom to the top? Is it flyable in different wind directions and, if so, how many? Perhaps most important of all, talk to prospective instructors personally. Do they sound knowledgeable (or cocky)? Do they seem to care about you personally, not just financially? Do they seem to have a conservative and cautious attitude? Do they give you a "warm and fuzzy feeling"? Where can I fly after I learn how to? Lots of places! Click here for a list. We hope to see you in the air soon! © Merlin Flight School. All rights reserved. Site design by CDClark Web Development.